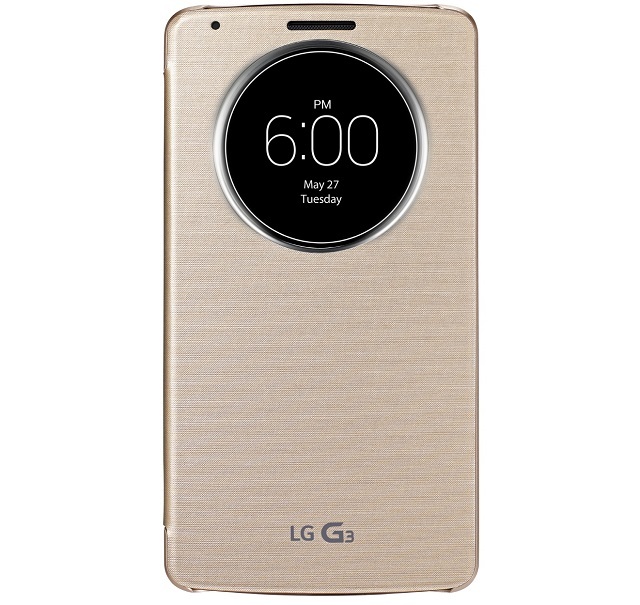 Just like they did with the G2 cover, LG have gone ahead to announce the G3 LG Quickcircle case (which apparently has already been trademarked) ahead of the launch of the phone next week. It’s getting standard now for LG. The LG G3 has been quite an open secret that has managed to stay away from mystery for quite some time. Possibly a teaser like this recent one or a way to let people consume what the LG Quickcircle case has to offer before the device goes out and accessories become just that, accessories. The Quickcircle has a circular peek screen on the case unlike others like the Galaxy S View case. It shows various things like time, allows users take and make calls, send and read text messages, take photos and listen to music. It also provides a window to preview health information. A hint that the Lg G3 comes with a non-removable back, the LG Quickcircle case covers the back unlike those of Samsung which replace the back cover. It also provides a grip solution as the G2 was said to be quite smooth in the back hence that added grip becoming necessary. The case will come in 5 colours: Metallic Black, Silk White, Shine Gold, Aqua Mint, Indian Pink. LG will avail a software development kit for developers to optimize their apps for use with the LG Quickcircle case. LG is expected to unveil the 5.5 inch G3 to be the flagship device of 2014 and rival the Samsung Galaxy S5, Sony Xperia Z2, HTC One M8, Lumia 930, Huawei Ascend P7 and other flagships announced in Q1 2014. Previous articleNew Nokia X2 With Upgraded Specifications coming up?